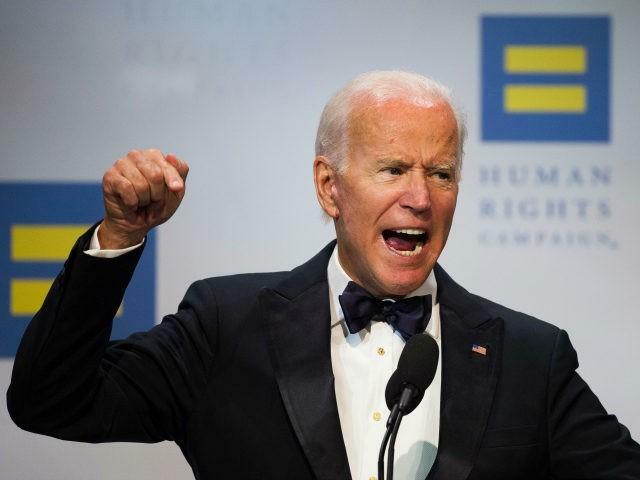 Former VP Joe Biden: Trump Supporters Are The "Dregs Of Society"
Former vice president Joe Biden is going on an insult tour, calling supporters of President Donald Trump the “dregs of society.” In a not-so-classy move, Biden used a pro-LGBT Human Rights Campaign annual dinner on Saturday to rip supporters of Trump and the president. “To just be grossly generalistic, you can put half of Trump supporters into what I call the basket of deplorables,” Clinton said in September 2016. “Despite losing in the courts, and in the court of opinion, these forces of intolerance remain determined to undermine and roll back the progress you all have made,” Biden said. “And instead of using the full might of the executive branch to secure justice, dignity, safety for all, the president uses the White House as the literal - literal - bully pulpit, callously - callously - exerting his power over those who have little or none,” Biden continued. “God forgive me,” he added, making the sign of the cross as the audience vehemently applauded. Biden and his wife Jill both acted as if the apocalypse was coming thanks to Trump’s supporters. “This is deadly earnest, we are in a fight for America’s soul,” Biden said. Jill accused Trump of being a bully. “There is nothing that makes either of us more angry than a bully. There’s nothing that’s more unfair or unjust than people using their power to try to make other people feel small, to tell them who they are or what they are capable of, to say their identity doesn’t belong,” she said. ✅ Clinton blamed Trump for all that’s wrong with America. ✅ Feinstein weaponized sexual assault to defeat a SCOTUS nominee. No, Joe Biden, the 1.5 million Tennesseans who voted for President Trump are not the "dregs of society."